« First a Twitter Proposal, next a millionaire? 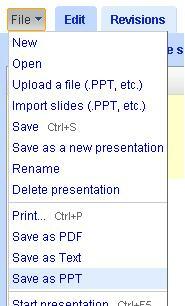 Google Docs rolled out a pretty necessary feature today if they intend to get people using their presentation tool. They rolled out the ability to save your Google Presentations as PowerPoint (PPT) files. Honestly, I’m a disappointed it took so long but I understand their quest to take over the world and keep people inside their applications. Like it or not, Microsoft still commands a huge share of the presentation software market with it’s PowerPoint product. In order for Google, or any of the other start-ups, to ease the transition for users it’s imperative they allow users to save in the traditional PPT format. If users know they won’t impact how other people have to view something, they’ll be a little more likely to make the move from desktop to webtop. I personally like the online collaboration features that Google has built into the ‘Docs’ application but not many of my friends and family are into it. And for those of you that work in large corporations, let’s be honest, you’ll be sending out presentations as attachments for a while longer. Good job Google, keep ‘em coming! This entry was posted on Tuesday, April 8th, 2008 at 7:53 pm	and is filed under technology. You can follow any responses to this entry through the RSS 2.0 feed. You can leave a response, or trackback from your own site.